Scottish physicist whose work in optics and polarized light is remembered in Brewster's Law. In 1817, he patented the kaleidoscope. Prophetic of infidel times, and indicating the unsoundness of our general education, “The Vestiges of the Natural History of Creation,” has started into public favour with a fair chance of poisoning the fountains of science, and sapping the foundations of religion. Review of the 4th edition of Chambers’ Book, 'Vestiges of the Natural History of Creation', The North British Review, 1845, 3, 471. 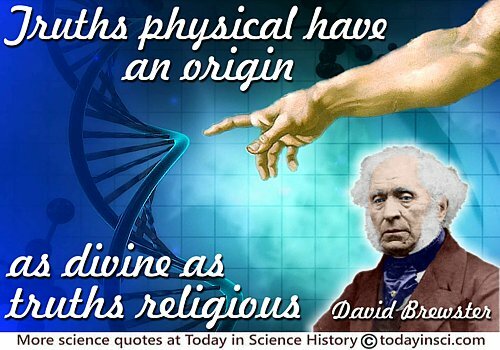 Science ever has been, and ever must be the safeguard of religion. More Worlds Than One: The Creed of the Philosopher and the Hope of the Christian (1856), 131. In More Worlds Than One: The Creed of the Philosopher (1856), 132. Truths physical have an origin as divine as truths religious. 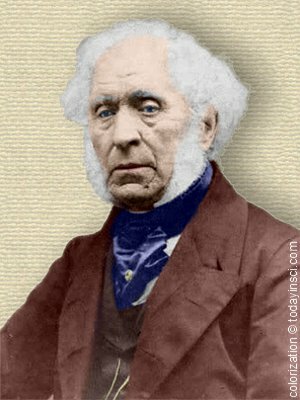 11 Dec - short biography, births, deaths and events on date of Brewster's birth.